God's Traitors by Jessie Childs on Audible: http://www.audible.com/pd?asin=B00QFJUG54&source_code=AUDORWS1201149BVY Get this audiobook for free when you try Audible: http://www.audible.com/offers/30free?asin=B00QFJUG54&source_code=AUDORWS1201149BVY Summary: For many Catholics, the Elizabethan "Golden Age" was an alien concept. Following the criminalization of their religion by Elizabeth I, nearly 200 Catholics were executed, and many more wasted away in prison during her reign. Torture was used more than at any other time in England's history. While some bowed to the pressure of the government and new church, publicly conforming to acts of Protestant worship, others did not - and quickly found themselves living in a state of siege. Under constant surveillance, haunted by the threat of imprisonment - or worse - the ordinary lives of these so-called recusants became marked by evasion, subterfuge, and constant fear. 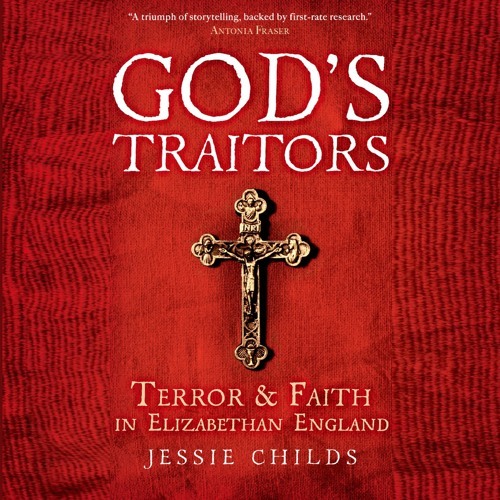 In God's Traitors, Jessie Childs tells the fascinating story of one Catholic family, the Vauxes of Harrowden Hall, from the foundation of the Church of England in the 1530s to the Gunpowder Plot of 1605, and their struggle to keep the faith in Protestant England. Few Elizabethans would have disputed that obedience was a Christian duty, but following the excommunication of Queen Elizabeth by Pope Pius V in 1570 and the growing anti-Catholic sentiment in the decades that followed, it became increasingly difficult for English Catholics to maintain a dual allegiance to their God and their Queen. Childs follows the Vauxes into the heart of the underground Catholic movement, exploring the conflicts of loyalty they faced and the means by which they exerted defiance. Tracing the family's path from staunch loyalty to the Crown, to passive resistance and on to increasing activism, Childs illustrates the pressures and painful choices that confronted the persecuted Catholic community. Though recusants like the Vauxes comprised only a tiny fraction of the Catholic minority in England, they aroused fears in the heart of the commonwealth. Childs shows how "anti-popery" became an ideology and a cultural force, shaping not only the life and policy of Elizabeth I, but also those of her successors.